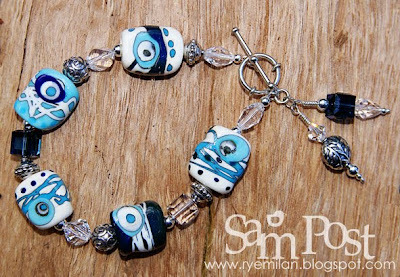 This little bracelet features more astoundingly beautiful lampwork beads by Sari of Gaialai on Etsy. 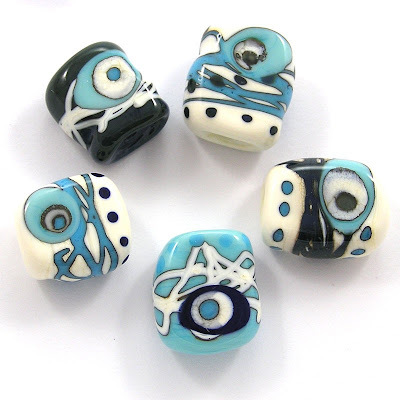 I just love the combination of blues that she has used for these, and the lovely designs too! (Photograph by Sari of Gaialai on Etsy). The silver beads and findings are all Sterling Silver and the crystals are Swarovski. I have used cubes, helix, ovals, a bicone and even a tear drop (never used one of those before - me likey). The two blue cubes are in Montana Blue (makes me want to pack a bag for Montana tonight!). (Blogged to: Blame it On the Boogie - The Jacksons and Bette Davis Eyes - Kim Carnes). Hi Sam, I'm a pretty old subscriber to your incredible blog. So sorry I haven't commented until now. I've been looking at your AMAZING jewelry!!! You are so very talented. I want to buy ALL of your bracelets!!! I was looking for your etsy shop, do you have one??? Or are all these beautiful pieces your personal collection? I just can't believe how gorgeous these bracelets are. I can picture each one with the outfit I would wear it with. :0) Just wanted to let you know how much I really do enjoy your blog. Thank you for taking the time to share with us all!! OOOOOO WOW this is absolutely stunning! Bright Colours to Warm a Cold, Rainy Day!